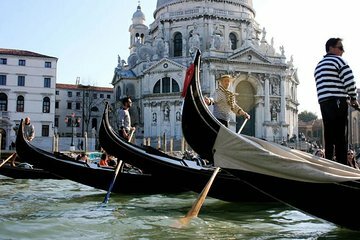 Experimente as duas coisas mais requintadas de Veneza com um passeio de gôndola e um passeio pela Basílica de São Marcos. Veja as vistas da cidade do canal a partir da água durante um cruzeiro de gôndola de 35 minutos, seguido por uma visita guiada à joia bizantina de São Marcos. This was the worst tour that we have ever taken!! It was total chaos as the guides separated us by our sticker color. There was no direction by the guides on what the plan was and where we were headed. It was 'orange stickers here, green stickers there....' Once in our sticker group, we were ushered to a gondola. Again, no communication of what we were doing. LITERALLY no words spoken. Once on the gondola, our captain spent the majority of the time on his phone. He said absolutely nothing to us - NOT ONE WORD! When we were ushered off of the gondola, some guy pointed us to go around a corner. We assumed that we would be meeting a guide to continue our tour to St. Marks. There was no one there!! And there was no one anywhere to question what we should do to get to our skip the line tour of the Basilica. Terrible experience all around! Gondola ride was really fun. St. Mark's Basilica tour at 1 hour was good timing for us as we were traveling with a teenager. Church tour guide was very nice, knowledgeable and spoke perfect English however, would have preferred a bit more information on the history of the Church, e.g., construction who, when, etc., as it appeared that much of that information had been shared in an earlier tour that preceded ours. In any case, we still recommend this tour - skip the line was really helpful - and seeing the mosiac art and other beautiful works were incredible. This tour was so fun! We started with the Gondola Ride. There are about 6 to a gondola and it was so cool to see the narrow passageways and see Venice from this perspective. Then we went to St. Mark's Basilica. You can't take pictures inside, but it is really beautiful and our tour guide was EXCELLENT. She gave us so much information without it feeling like an overload and was entertaining, too. Overall, I highly recommend this tour. It's a great way to spend a few hours in Venice! The Gondola ride was nice and relaxing. The tour of St Mark's was great, the guide was excellent and explained what we were looking at with great knowledge. Skip ihe gondola ride. Almost total waste of time. Course was crowded narrow back channel route with no scenery whatsoever out onto the Grande Canal where gondoliers just sat side by side chatting with each other killing time to fill the 30 minute commitment. The St. Marks tour was fantastic!!!! This tour was not coordinated well at all. There were 2 different meeting locations, but no one knew which one was correct. The guy wed up late to meet us. The coordinator then said meet us at the tower after the ride for the tour. The Gondola ride was nice. Then we went to the tower and had a hard time finding the group. St Marks tour was very crowded. We could barely hear the tour guide as he kept up front and there was static. He then started talking politics and Trump. The tour lasted forever and the last 30 minutes were all politics while sitting. Not effective and not worth the money. Very romantic ride on the water. Although it was hard to take a picture because we had to balance each side, we still manage to take it but not all of us in the photo. Gondola ride was ok but the St. Mark's Basilica tour was very unorganized. I would not recommend this tour!